Growing up in the era of Sam and Diane on Cheers and Ross and Rachel on Friends, I learned the hard way that in the world of comedy, once sexual tension disappears and the lead characters finally get together, the humor goes right out the window and the stories become increasingly dull. And if they survive the obligatory breakup or two to help nail ratings during sweeps and finally make it to the altar, it’s a surefire recipe for disaster as happily ever after translates to creatively boring ever after. This being said, after penning the horrid Wedding Date (although we won’t hold that against her), screenwriter Dana Fox took a tremendous risk in her follow-up effort by jumping over the “boredom” hurdle early on by having the characters marry shortly into her new film What Happens in Vegas. After the spontaneous vows, Fox ramps up the loathing until it melts into fiery sexual chemistry, pushing and pulling the characters like magnets until they finally, as the genre and audience mandates, get together in the end. Although not entirely successful and woefully uneven, the resulting film gets off to a highly energetic and fast paced start. In his Hollywood feature film debut, Starter for Ten director Tom Vaughn introduces us to the painfully perfect Joy McNally (Cameron Diaz) as she realizes that it’s this penchant for planned perfection that has driven an immeasurable wedge between herself and her dull, Ivy league poster fiancé Mason (Jason Sudikis) when he dumps her just outside his surprise birthday party. Instead of cake, Mason dishes up excruciatingly private details about their love life before Joy and her best friend Tipper (a delightful Lake Bell) decide to cut loose in Vegas, taking advantage of Mason’s now moot birthday present. Also hightailing it to sin city, we find recently fired Jack Fuller (Ashton Kutcher) who loses both his carpentry gig and his insistence for a one hundredth second chance in a basketball game with his father and boss (Treat Williams). With his wingman-- and no, I am not making this name up—Hater (Rob Corddry), Jack hopes to settle in for an evening of wild abandon before due to a double booked room, they literally run into Tipper and Joy. Several drinks, dares and hyper cuts later, the unlikely foursome discover that sometime during the night, Jack and Joy said “I Do” but before they can proceed with a divorce, Joy’s quarter is played in a slot machine by jackpot winning Jack. Back in New York and faced with Dennis Miller’s Judge Whopper (again, the name isn’t a joke), the two are sentenced with “six months hard marriage” instead of a divorce to try and secure their share of the three million dollars and must cohabitate in Jack’s unsightly, bacteria infested, cramped bachelor pad in between sessions with court ordered marriage counselor Queen Latifah. It’s around this time that the tone shifts from screwball to hostile and the jokes become over reliant on crass toilet humor which it turns out is exactly what the screenwriter would have hoped for as a good bulk of the comedic fodder exists in, about or around the bathroom. After Fox, Vaughan and his tireless leads flush those away, What Happens in Vegas takes a violent turn towards The War of the Roses, except without that film’s success, until soon the two predictably realize that maybe between food fights and pratfalls, they actually-- you know-- kind of dig each other. 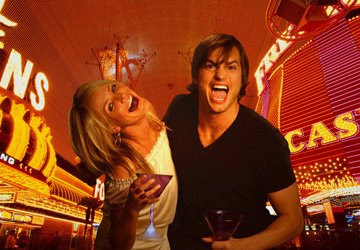 Messy and ultimately sitcom worthy, What Happens in Vegas isn’t quite the overwhelming bomb most critics had predicted when the posters and trailers began creeping into theatres at the start of 2008. However, in the careers of Kutcher and Diaz, both of whom are in desperate need of a (box office) hit and not Vegas’s “loaf of bread” hit, after minor summer movie interest, it’s destined to disappear like bathwater down the drain.